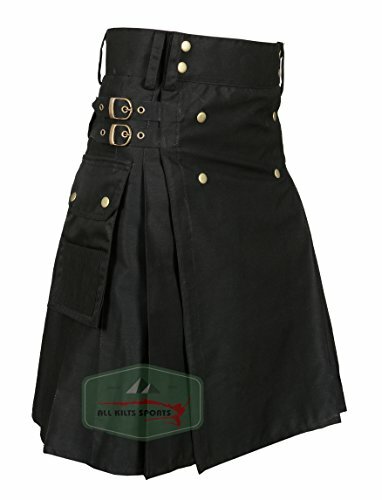 Men's Stylish Black Wedding Utility Kilt - Utility Kilts (42) by All Kilts Sports at SCRHI. Hurry! Limited time offer. Offer valid only while supplies last. Finding your Waist size Using a measuring tape, wrap it around your waist where you'd like the top of your kilt to sit. Don't hold in your stomach. Finding your Waist size Using a measuring tape, wrap it around your waist where you'd like the top of your kilt to sit. Don't hold in your stomach. This measurement is usually 2" larger than the size of your pants. You might consider giving yourself an extra inch, or so, for comfort. Take your waist measurement (in actual inches) and see where it falls in our size grid below. If you have any questions about this product by All Kilts Sports, contact us by completing and submitting the form below. If you are looking for a specif part number, please include it with your message. Kilt Society Mens 7 Piece Full Dress Kilt Outfit- Black Watch Tartan with White Hose 38" to 42"
Kilt Society Mens 7 Piece Semi Dress Kilt Outfit- Black Watch Tartan with White Hose 38" to 42"
Kilt Society Mens 7 Piece Casual Kilt Outfit with White Hose - Hamilton Tartan 42" to 46"
Mens Heritage of Scotland Tartan 7 Piece Casual Kilt Outfit Size: 34" - 36"